very scared! I keep waiting for someone to pinch me and wake me out of a dream. Can we have had such a snow less winter?! I can hear a collective sigh of relief from Golf Course proprietors and golfers around Northeast Ohio. This has been a dream! Some of our Annual members keep track of rounds played month by month and through out the year. The numbers are remarkable compared to last year. How many is it now Gary and Ken? Let's hope the numbers keep going up. Aside from having some play all winter long, the nice weather has allowed Jeff to get a head start on getting the course clear of debris and other assorted animal "droppings". He has been out every day on the Steiner, pushing and pulling, raking and trimming, primping and polishing! He's like a Mom getting her daughter ready for her first formal. Oy! Rock on Jeff.....your the best! Now if I could just get Jake back in the swing of things, the course should be in mid spring form early for the Chili Open. How many days? As for me, well let's just say I'm a little behind on my chores. That kitchen keeps calling me, but I seem to find some other project to occupy my day. I power washed the patio ceiling the other day, which of course resulted in my having to wash the windows because of the over spray, which resulted in another and another and yet another job. You all know how that goes! But it's done and looks pretty good. Although my arms were screaming the next day. Man I'm out of shape! Not to mention the steam facial I gave myself while I was at it. I'm sure I was source of entertainment for the traffic traveling down 303. "What the H@#* is that tall chick donning the yellow rain coat trying to do?" Yikes!! I received my first entry for the "Team Pride" Contest today. 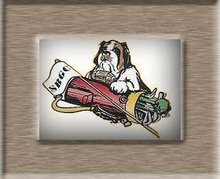 For those of you who don't know yet, I'm holding a contest for the best photo of you, your family or friends donning the St. Bernard Golf logo in a remote or unusual setting. It's kinda like "Flat Stanley". Flat Stanley is a paper doll that young school students give to their parents or grandparents when they travel. They take a photo of themselves with Flat Stanley on vacation and mail him back with the photo. The photos are posted in the class room, then they learn and discuss geography. Kinda cool. (Flat Stanley got held hostage in Hawaii one year)....Ooops! Anyway.... A prize will be reward for the most creative and unusual photo. Jeff is the Judge, and his decision is final. So remember your St. B gear when you travel, and send in those photos. That's all I got for now.....Time for me to go in search of dinner. Remember...Daylight savings time starts the 11th, then St. Patty's day after that. Both sure signs of Spring. Think Green!!! HOPEFULLY THE COURSE WILL DRY OUT A BIT WITH ALL THIS WIND. MAYBE THE PINS CAN GET MOVED FROM THEIR WINTER POSITIONS. Looks cold for a couple of days, but no real snow threat. We might just luck out. Maybe Golfmama can sneak away on these cold days?? It is a country in a continent that begins w/an "A". One of your employees has been there...not to the country but to the continent. Does that help you out at all? I think the chix could help you out w/the flat stanley experience. we've had that here. A day and a half until Chili Open! Is this Blog Site closed for repairs? GM busy spreading mulch, cleaning carts and cleaning up in general. Too tired to post! Oy! Will be back on track after Chili Open....ONE more day!